Follow this blog: subscribe, Facebook or RSS feed. I know and believe so, that many have been wondering about Grace, and her blog postings. Yes, I have taken some months without blogging but good enough, the interesting stories about the clients’ businesses and social lives still appear on the website for you to read and fund if possible. Once again, I would like to commend all the fans of Kiva for the wonderful job of supporting and in turn spreading the word. A quarter million hits and counting! Perhaps a few of you noticed in the sidebar to the right that Kiva Stories from the Field recently passed 250,000 views. Started in summer 2007, the blog was intended to promote the work of Kiva Fellows in the field and to provide a view into the daily lives of these incredible, generous people doing their part to promote Kiva’s mission of connecting individuals through lending for the sake of alleviating poverty. This blog has seemingly inspired a number of other social enterprise blogs and Kiva is quite proud of the reach, breadth and enthusiasm shown toward these stories. We have recently been added to Lonely Planet’s blogsherpa program which automatically links content from specific countries to those pages on the Lonely Planet website. See Liberia for an illustration of how Kiva Fellow Dave McMurtry has become one of the voices for visitors to the West African nation. It is our aim to continue to provide high quality personal stories and observations on a daily (or nearly daily) basis. Please share the blog with your friends. And we would love to hear your suggestions for stories you’d like to read! I have always wanted to write something about our transport system and the huddles involved for one to get to work early and let it be printed in the papers but again part of my mind said why not for us here! Eeh before I forget, taxi are the matatus we use here in Uganda, while ‘Maaso awo’ means find the next stage for me to get off. As a Kiva Coordinator, Pearl Microfinance, the work I do involves a lot of movements with so many hardships, but if all this is to be added on to the messy taxis, traffic jams and the rude taxi operators especially the conductors, then my day will be messed up to the extent of killing my morale and ever wishing to grow wings to fly over to my destinations; but interestingly, the thought of meeting all the wonderful clients and their businesses restores every bit of my confidence and courage to face anything that comes my way. In Uganda, mostly in the City centre and the neighboring towns, we have had a chaotic transport system which I think every one is having a share. Each morning as I wake up, among the things I think of is whether I will get a fare taxi to take me to town to a stage next to my work place. This is a thought that comes to only those that wake up very early, leave alone those that leave home late and have never experienced such. First of all, getting a taxi will mean you have the energy and power to push others away to find a seat inside so that you are not late for work. On many occasions, I have had to step on people’s polished shoes but frankly speaking people care less because we all do it at some point. Others have lost their belongings like watches, phones, and bags have been spoilt in the process of squeezing each other; and funny enough not to the pick-pocketers but to the ground. Such a situation would have been a bit fair for us who choose to ‘fight’ for the seats but in a way, this is a blessing to the taxi operators who on seeing such a mess will and have always increased the fares to more than double. Take an example of Bweyogerere stage where I come from, on a normal day, the taxi fare can be 500 shs but when such a time comes, it is usually tripled and sometimes more. Here most of us have had to choose to either be late or spend more for the journey; in most cases, we choose option 2. When it comes to the evenings after work, it’s terrible. People are too many for the taxis; the jam is too much, fares hiked yet people do not want to spend more than enough but then who would fancy spending too much. I have always had to take my bazungu friends for shopping and whenever they mention out the price to them, they would lean back to ask, ‘Isn’t that a muzungu price?’ meaning isn’t that too much? So every body is cautious, hence my claim justified. The taxi operators usually have a saying mostly in the evenings when they want us to board their taxi that goes, ‘if you are a responsible citizen, board now so that you have time for your family’. At first, this made me feel guilty considering that I leave my family early before some of them could wake up and then go back late in the evening when they are almost ready for bed but I have learnt to explain to them and thank God they are happy whenever they see me; and however much the taxi people talk, they don’t move me until I get a taxi with a fair charge. The scenario above affects mostly those without their own cars but even those that have cars have wanted to run away from the traffic jam by either taking a fast boda boda to work but again they think of where to park their cars and the costs involved; and in the end will drop the idea. The writer in a morning taxi that is stuck in traffic jam on the way to work. About the ever changing taxi fares, I think we the passengers need to find a solution to our dilemma as was a case recently. It was in the morning and the fares were hiked; we all agreed that with the next taxi, let us all not board but surprisingly when it showed up, five people were quick to jump on but the rest of us decided not to. This is when the operators reduced the fare to normal with bitter words to accompany the news but all the same it worked and all the taxis that followed did the same. To me, this is the solution that can save us since Utoda; the taxi governing body seems to have turned a deaf ear to all the passengers’ claims. The same thing is happening to the fight against poverty. By making the financial services available for people to develop their businesses, their general livelihood will change for the better. And this is something that is jointly done by Kiva, Kiva lenders, Kiva Fellows, the Microfinance Institutions and the Clients. Together, we can always achieve our goals. For the alleviation of poverty in Uganda, Microfinance Institutions are in the pilot seat by providing micro loans to the poor. The areas of operation depend on an Institution’s Vision and Mission, and like at Pearl Microfinance, financial services are provided to the economically active population of Uganda sustainably. MFIs’ operations can not go on without the recognition of credit officers, a position that requires a lot of dedication, hard work and trust. The credit staff should have good people skills for if not, institutions would lack who to lend the money to or worse still, the existing clients are bound to fly over since they have many Institutions to choose from. They manage many lending groups and it is their duty to monitor each group for timely disbursements, loan repayments and trainings in better business skills. However, they face hardships like heavy rains leading to slippery and muddy roads, dusty roads with the scotching sun that mercilessly burns their heads. And actually our obligations at Kiva largely depend on the credit staff since they organize, train and disburse loans to the various groups that are known to us all; after which they ensure that the groups make their repayments on time. Kiva is doing a very commendable job in funding clients through the website just like the clients ensure that whatever amount disbursed is repaid on time. The same recognition also goes to the hard working and devoted client’s that are very much willing to put their trust in the mutual relationship we have with them. Take the example of Namulindwa Suzan, a 10 year old client with Pearl Microfinance in Gakuweebwa munno women’s group in Lugazi. She has a business of selling new clothing to daily markets called “mubuulo” which she buys from Kampala. Such markets are a collection of many entrepreneurs with various merchandise with a hope to sell to the customers who constantly flock the shopping stalls in the demarcated market areas as some markets reoccur weekly or bi-monthly and amazingly, no one concerned ever forgets the day and date and will always look forward to their next shopping whose prices are considered lower than shop prices. To reach these markets, entrepreneurs like Suzan come together and hire a truck to take them with their merchandise to the market and pick them up after the day’s sale. And since the daily markets are never booming in the morning hours, Suzan has ample time to prepare her children for school, prepare the day’s meal and serve her husband before she sets foot only to return home after 9pm. The saying, “when good character and hard work find opportunity, wonderful things happen” comes to terms with Suzan since with the help of loans, she has been able to increase stock of the clothes she sells and this has enabled her to pay school fees for her 4 children plus 3 relatives in her care, she has bought herself another plot of land, she has two cows, one giving her milk and she has hopes of more developments. Figure 1: A typical wednesday market in Njeru County in Jinja. Very true, women are instrumental in the poverty eradication process; take the example of Babirye Eflance. She had never thought of joining any lending group not until a day she was sent packing by her husband. It all started when she gave birth to her 5th born Sarah. At the age of 3 months, Sarah developed some abnormalities like having a loose neck, rolling eyes with a generally very weak more like a borne less body. She took her to the various clinics and hospitals with no solution to her sickness and this prompted the husband to send her packing with the rest of her children. Having no where else to go, she headed back to her parents’ home who managed to set apart some little money for her as capital to start a small retail shop. Figure 2: Babirye Eflance with Sarah, her daughter. After a few months, and by word of mouth, she was introduced to Pearl Microfinance and since then, life has never been the same. She has been able to include the sale of charcoal, mukene, tomatoes, pineapples and many others hence increasing her savings each day. As a result of her persistence and hard work, she has been able to educate her children of which 2 are now secondary school teachers, 2 are managing their own businesses while Sarah is able to access her medication, her life’s dependency. Eflance has asked for another loan through her lending group with the hope to restock her retail shop with more products like sugar that will bring in more income. This is not a story of sympathy but to show how she has managed to pull herself out of sheer poverty. In every development, we are supported by others and it takes one with a big heart to sacrifice the little they have for some one else’s big achievements. Good Luck. Working as a Kiva coordinator for a Microfinance Institution is an interesting and fulfilling obligation especially for one that has the interest and capacity to do so. In most cases we get the chance to do what we are supposed to do, interact with clients, take photos, write stories, and make these experiences known to the world through posting them on the website; yet again we keep our lenders posted on the progress of the businesses they have supported and how this affects the social lives of the entrepreneurs. It’s an interesting bit really. Another interesting bit about working with Kiva is being in close relations with the Kiva Fellows that are assigned to the MFIs. Surely I wish to copy their courage because in almost all instances, these Ladies and Gentlemen come to the country only knowing the name of the Institution they are to work with plus knowing that they have to visit clients in some rural places but they are always together like they have been here for long and it’s only those in close contacts with the fellows that can explain this to the rest; Ooops!! On the look of things, the duties of a Kiva Fellow are largely undefined to allow for maximum flexibility once they arrive at their respective MFIs. At least for the Kiva Fellows we have had so far, and probably wherever else they have been, our relationships with Kiva are as smooth as never before and we are grateful for this. Unless you know that the Kiva Fellow came in yesterday, or last week, you might believe that they have been here long enough to know every one and everywhere even better than us the natives. I have come to believe that a neighbor or friend can know your home better by paying attention to those things that you might call minor, and will beat you at your game. • Will they cope with the situation at hand? • How about our transportation means of mostly using Taxis and motor cycles (boda bodas)? But time has made me believe that some people are born managers and will utilize the available resources for their comfort. 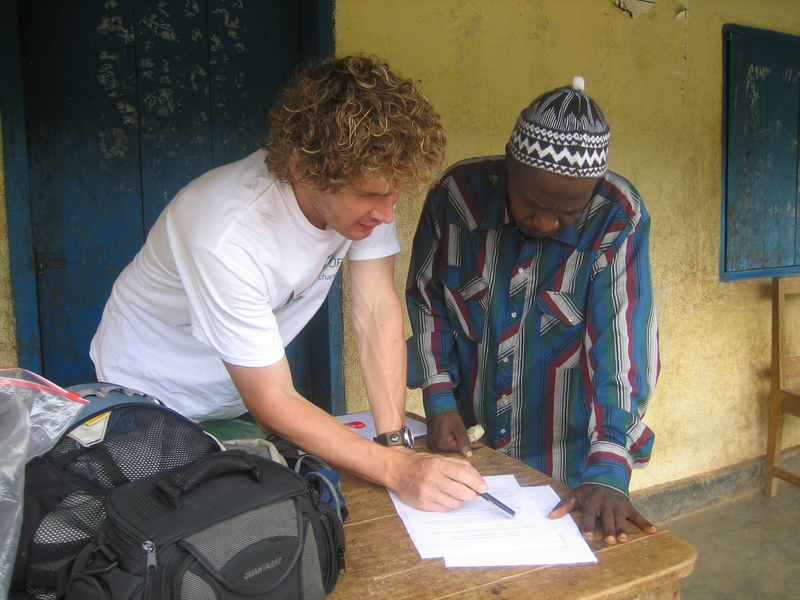 Working with Bill Brick, our recent fellow at Pearl Microfinance Ltd., has been a great opportunity for us as an organization and for me as a Kiva Coordinator, my personality and my career. Bill came with a lot of development, hard work, courage and commitment that we at Pearl feel more pleasured to have him around. Bill met with Elda, Juliet, Grace and Lillian all Staff at Pearl Microfinance during one of the decentralization training programmes for Kiva. Can you imagine, whenever we had to visit a group in the field, all he needed to know was which side of the country we had to take and in an instant his map that he would pull out from his bag would enable him familiarize with the journey and that was all. In almost all our movements, I have heard to feel pity for the fellows especially on dusty bumpy roads, hot days, and even when it has to rain, though they like it, so they tell me. I remember one time we had to visit a group in Mpigi where we took a taxi from the New Taxi park. At first we enjoyed the comfort of a tarmac road, until a certain point when we reached Nateete through a dusty bumpy road until we reached Kasanje, our destination. Surely as a native, there are some things you consider normal and would not be bothered at all when they come your way not until when you realize that the person you are moving with is uncomfortable but again you are already set and surely you can not turn back. I personally hate rain on my day out in the field but I came to realize that the rains brought a bright smile on Bill’s face hence washing away my fears of ever soaking a muzungu all smeared with dust, with no where to turn for shelter. Operating in such places is why Pearl Microfinance exists to provide financial services to the economically active population of Uganda and we take these services right to our Clients’ sitting rooms; unlike most Commercial Banks. I will use this opportunity to commend my friends for the sacrifice they made working with Pearl Microfinance and me in beating deadlines to the point that I have had to make them move late in the night in the hands of over speeding taxi drivers; their ability to meet all their costs for the sake of the people who need financial services, and above all, we at Pearl Microfinance are grateful to Kiva for always availing an extra hand at no cost to help MFIs realize their visions. We shall always remain indebted to you. 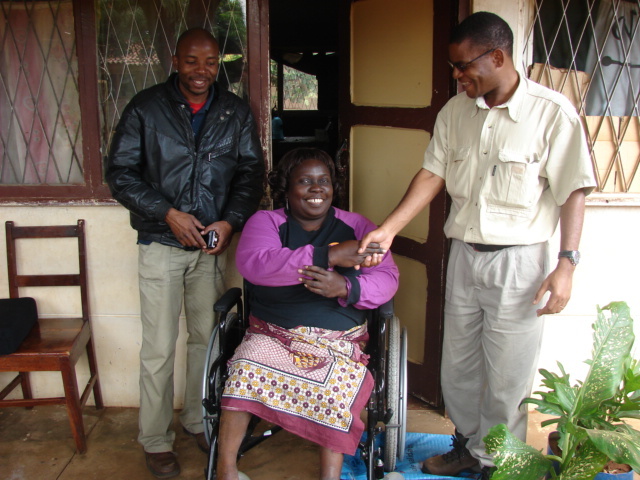 Wheelchair donated to a Kiva Mozambican client by KivaFriends!!! A week ago, Regina Jose, Hluvuku’s client in Mozambique, received a brand new wheelchair to replace her broken one!!! KivaFriends donated it, and with the help of many people it was bought, transported from South Africa to Mozambique and delivered to her!! Regina was so happy with her new wheelchair that she even cried! Now she will be able to resume her activities and will go to church on Sundays, something she described as her favorite activity. As I wrote in my last blog, it took just over one month since my first journal about Regina to get all this done. One of Regina’s lenders who is also part of KivaFriends brought this into KivaFriends attention and in a teamwork event it was successfully concluded! As I mentioned in my last blog, I’m quite impressed with this network of good-hearted people that don’t know each other in person but work together for the same cause – to help those in need. The picture shows Regina shaking Bernardo Tembe’s hand (Hluvuku CEO) and with Ernesto Rungo, Regina’s loan officer from Hluvuku. I’m already back from my fellowship in Mozambique and as some other fellow fellows, I will write about my microfinance experience in my next blog.